Starting a new business is exciting, but it also be daunting to most of us. What do you need to know to ensure you’re starting your business off right? If you are thinking about starting a business or have one up and going here are a couple of things to do to make sure you’re on the right foot with your business. These small steps will save you time and money in the long run. Making sure you have all of the appropriate paperwork in order for the state, your business name is reserved and you’re empowered to use it on legal documents, bank accounts, and marketing, and knowing your financial accounts are setup properly to avoid challenges with the IRS later all seem a bit much if you’ve never done this before. And, the “do it yourself” sites available; although often filled with a wealth of knowledge to a certain level, often leave out the crucial extra steps needed to protect your assets in the long run or that guiding hand to make sure the recommendations you’re reading about apply to you. Aligning yourself with those you trust and who have vested interest in your success today is one of the best ways of starting your business off right. Bookkeeper – This financial professional will know how to structure your accounting to keep everything in compliance and in order for a CPA to prepare your taxes from. The right bookkeeper (like Carefree Bookkeeping) can also help you secure the right accounting systems and software, and will help you see the big picture when it comes to your business. They can identify spending habits, and highlight areas that may able to decrease spending or increase revenue. Are you charging enough? Are you paying for overlapping products or services? One of the biggest benefits of a bookkeeper? TIME. By tracking all of those expenditures and sources of income throughout the year for you, pulling together the information you need; already categorized and ready to go for the CPA or CTA at the end of the year will make tax time less of a headache and can even save you money. With reports ready at the push of a button, this means less time a CPA firm would have to spend sorting and categorizing reciepts for you in order to get the RIGHT tax filing paperwork in place and accurate numbers for that filing. Business Attorney – There are a lot of ‘low cost membership sites’ available today offering you ‘do-it-yourself’ document preparation. And, for someone starting out with limited budgets, this all sounds great. But, when it comes time to securing additional debt through bank loans, or hiring on staff, taking on consumer contracts, or making sure all of your assets are protected throroughly, these sites (or fill-in-the-blank forms at the local paper retailer) fall severly short and can leave you with disappointment, frustration, or challenges down the line. EX: Filing for a LLC can sound simple when you refer to these resources, but what they don’t tell you is if filed in the wrong order it can cost you more, and they don’t provide the additional pieces of documentation needed when applying for loans or certain insurance coverage. It’s important to find a local attorney who specializes in small businesses, like Theresa Johnson Law in the Twin Cities area does, to ensure you’re not leaving yourself open for scrutiny down the line. CPA (Certified Public Accountant) – You might ask yourself, “if I have a bookkeeper, why do I need a CPA?” The answer is fairly simple – Bookkeepers help you keep track of your day-to-day operational and marketing spending, and keep those compiling reciepts in order. They shine when it comes to keeping everything neat and orderly and compliant so pulling the reports you need for your accountant, the IRS, or your loan manager isn’t a daunting task later. But, the biggest difference is they do not prepare taxes. A CPA has the ability to do both financial management like a bookkeeper and tax preparation. They also shine when it comes to helping you do some financial planning and investing. They dive a bit deeper when it comes to financial scrutiny and analyzation of all of your assets to help you make better decisions when it comes to investments or securing new debt. Their biggest benefit is the security they provide in knowing your filing information properly and in accordance to current IRS rules and regulations. Are claiming too much? Are you missing things that could get you more money back? You may not need the intensity of the on-going services a full-service CPA can offer at the start, but you will certainly want one in your corner at tax time. Bookkeepers, CPAs, Financial Planners and Business Attorneys all compliment each other and ensure you’re on sound footings at the start. The number 1 thing to do is set up a separate checking account for your business, even if you just set up a second personal checking account with the name, example: John Smith Bus. If you have your business name properly registered this step can be a breeze and it’s an important one to ensure you minimize your liability. This simple step can be a big key in starting your business off right from the start. In January, John bought a used truck with a snow plow already installed on it and winter was just around the corner. John told me he was just going to start with his neighbor and do a couple of driveways to make the payment on the truck. John didn’t keep track of the days he plowed or how much he got paid, instead, he just put the money in his wallet if cash or his personal bank account. Now, if John had set up a separate checking account, and used that one account to deposit all the earned money into and make business related purchases like filling up his truck with gas after plowing or other expenses like salt, he would have had all the information his CPA needed by just printing his bank statements. By looking at all the bank statements the CPA would be able to fill out the schedule C correctly. Using the checking account set up for just your business and only your business transactions makes it easy to make a profit and loss statement and to see if your business is a business or a hobby. Additionally, avoiding the comingling of money from peronsal use to business use can help minimize scrutiny from the IRS if you’re an LLC who ever faces an audit. These are just a couple of the tips to help point you in the right direction. Starting your own business is an exciting adventure filled with ups and downs. 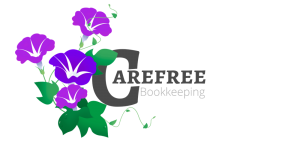 Carefree Bookkeeping wants to help you make the most of those ups and help you minimize those downs. Give us a call today for a free consult and see how we can help get you on the right path from the start!